Jingle, Jingle Jingle! Is that the sound of sleigh bells I hear? I can’t believe Christmas is less than a week away. 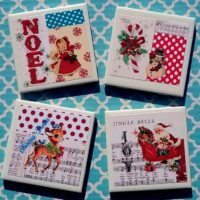 I have spent the last few weeks in a frenzy working on Christmas orders and have had no time to do laundry much less blog! I think next year I am going to have to plan a little better. Today I wanted to get in atleast one blog post before Christmas. 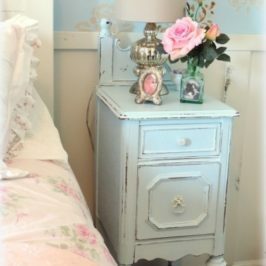 I am sure you are all finished with your Christmas decorating but if you still need a little inspiration for decorating for a vintage style Christmas read on! 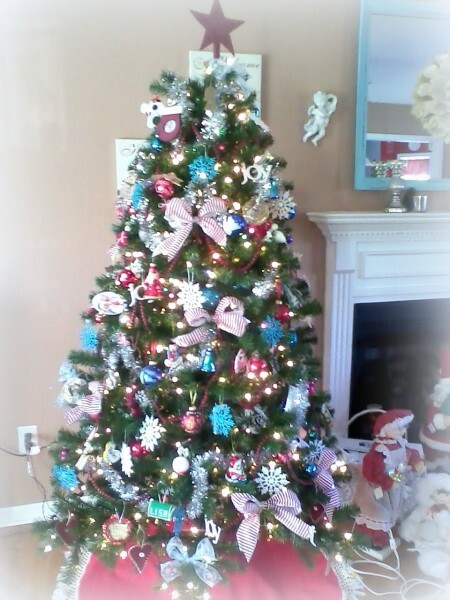 Today I thought I would share with you some pics of my past Christmas decorating endeavors and perhaps inspire you to create a little nostalgia in your own holiday decorating. Christmas time is possibly the most celebrated time of the year when people welcome the past into their lives. 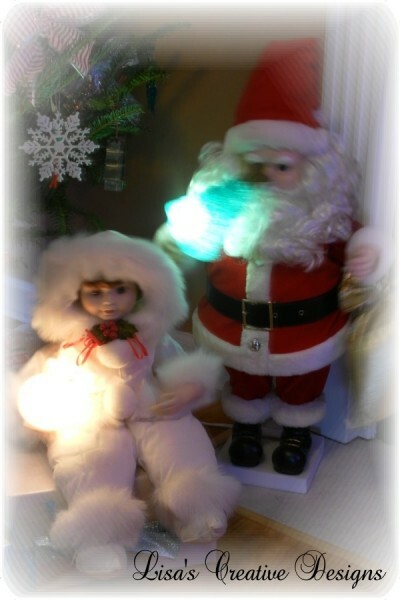 We remember our own childhood, when Christmas was magical and we want a taste of it. 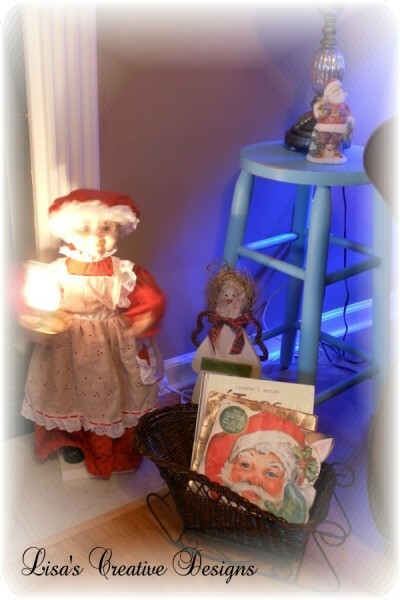 Decorating your home with vintage Christmas items can bring those warm memories to light. I love the graphics on holiday greeting cards of yesteryear. What says “Old Fashioned Christmas” more than vintage Christmas cards? 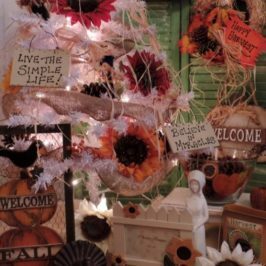 They can be swagged across a fireplace mantel, hung around a door frame or displayed around a window for instant vintage charm. 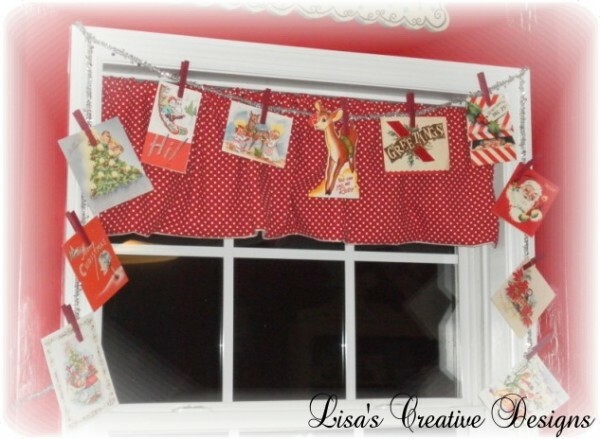 Swag a ribbon or some tinsel garland across a window frame and attach each Christmas card with a painted clothespin. 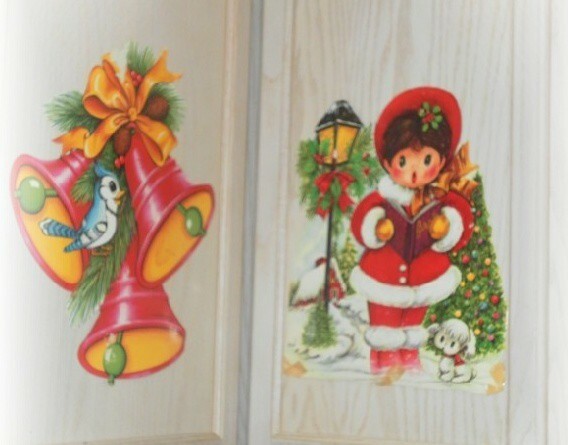 You can purchase vintage Christmas cards like these at thrift stores and yard sales if you are lucky enough to find them, or try shopping online at Ebay and Etsy.com . 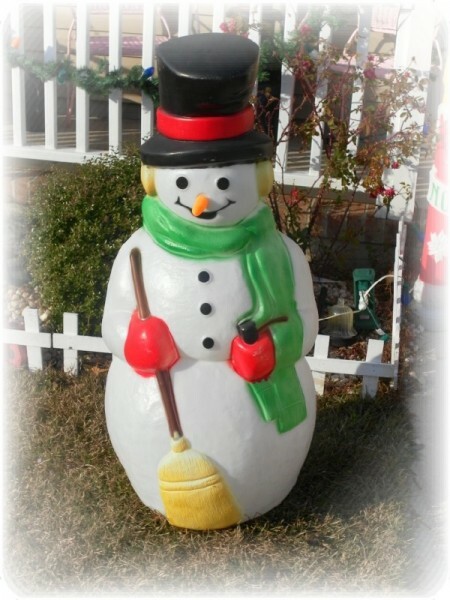 I don’t know about you but when I think of vintage Christmas kitsch, a lawn adorned with vintage blow mold plastic outdoor characters like this Snowman come to mind. 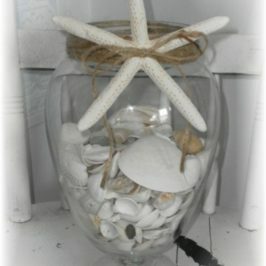 Still popular today, these outdoor decorations come in a variety of shapes and sizes. You can find Snowmen, Santas, Candles….the list goes on and on. Although you can still buy blow mold decorations brand new, keep your eye out when hunting local thrift stores and flea market for vintage ones. They just have more character I think! 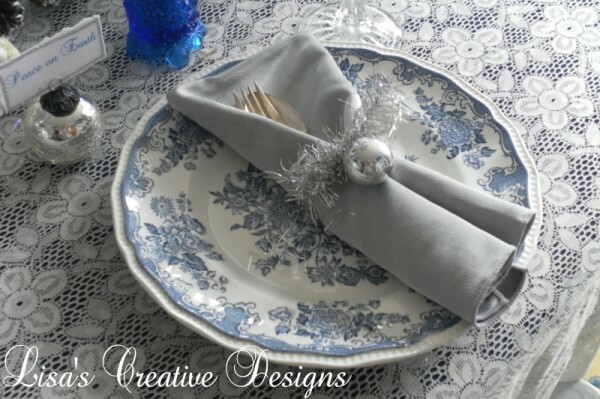 Setting your Christmas table with a vintage tablecloth like this one will definitely set the mood for an Old Fashioned Christmas. You can find them at bargain prices at local thrift stores but they can be hard to find. You may have more luck at antique stores, Ebay and Etsy but be prepared to pay a pretty penny for them. 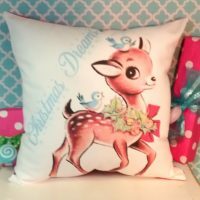 Even ones that are not in the best shape, with holes or stains can be recreated or “upcycled” into decorative pillows, ornaments and stockings, adding vintage Christmas charm to a room. 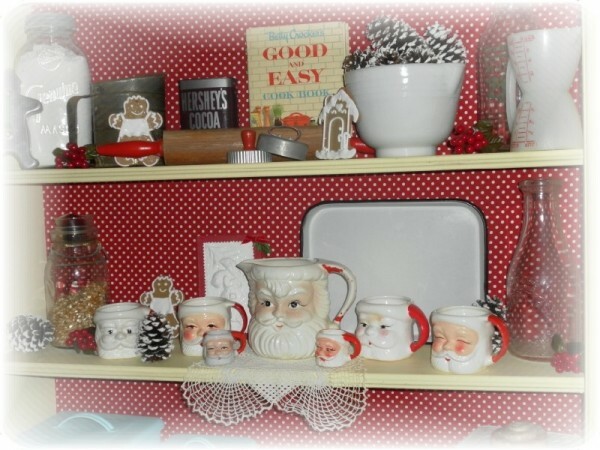 Incorporate your vintage kitchen collectibles into your holiday decorating by creating a “Baking Cookies” themed vignette on a shelf of table in your kitchen as I did here. Pull out a vintage cook book, a vintage rolling pin, fill a vintage mason jar with flour, and create a display using your everyday kitchen items. Tuck in a few faux gingerbread Christmas tree ornaments (or use real ones! ), some “snow” covered pine cones, some faux berries and voila! 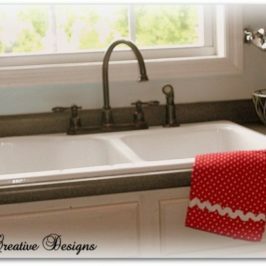 you have an adorable Christmas display for your kitchen! And let’s not forget the milk that goes along with those cookies! The vintage milk bottles and vintage winking Santa pitcher and mug set fits right in and looks great. To create snow covered pine cones just roll some pine cones found in your own back yard in wall Spackle, let dry and display them around your home. 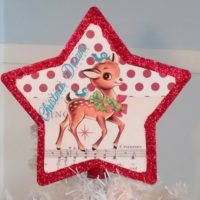 Vintage Christmas Die Cuts by the Beistle and Dennison companies definitely remind me of my childhood Christmas’. I remember them hanging from the windows in my Grandparent’s home and many other homes dressed up for the holidays. Candy canes, candles, snowmen and jolly old St. Nick smiling at passers by could get you in the Christmas mood. I love the graphic style of these vintage beauties. Display them on cabinet doors, hang them from the ceiling or make a garland to swag across your mantel. I do not recommend hanging vintage die cuts in the windows as exposure the sun can make them fade. Punch a hole in the top of each one and hang from a string instead of using tape to keep them in tip top shape. 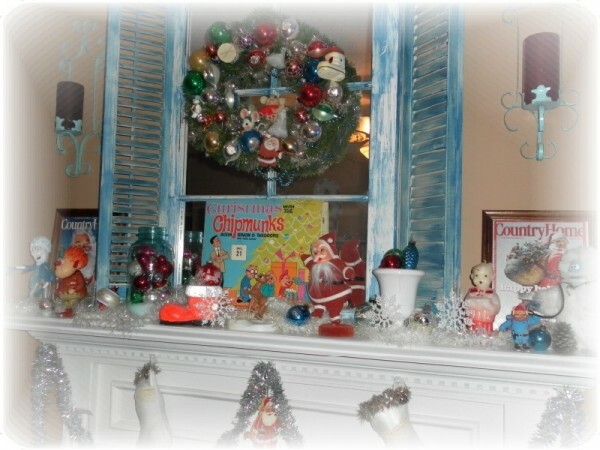 Decorate your fireplace mantel with vintage collectibles and accessories that are close to your heart. 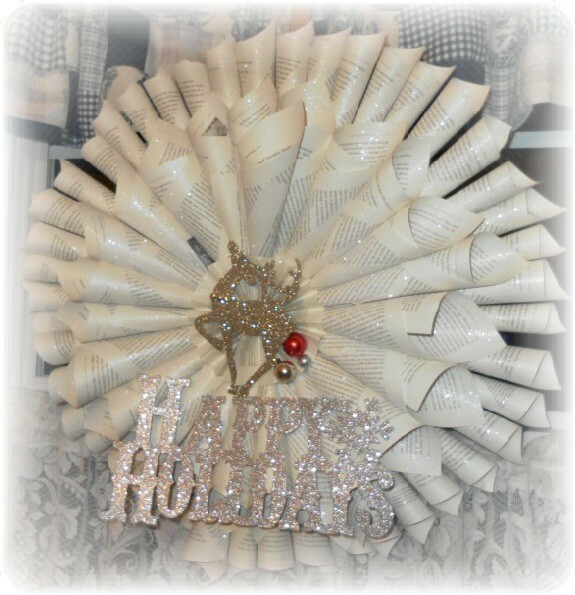 Create a Vintage Chic Christmas Wreath by hot gluing vintage ornaments and garland to a wreath form bought at your local crafts store. Vintage holiday record albums have wonderful vintage graphics covers that look great displayed on shelves, tabletops and mantels. Frame favorite old Christmas magazine covers for instant vintage charm. 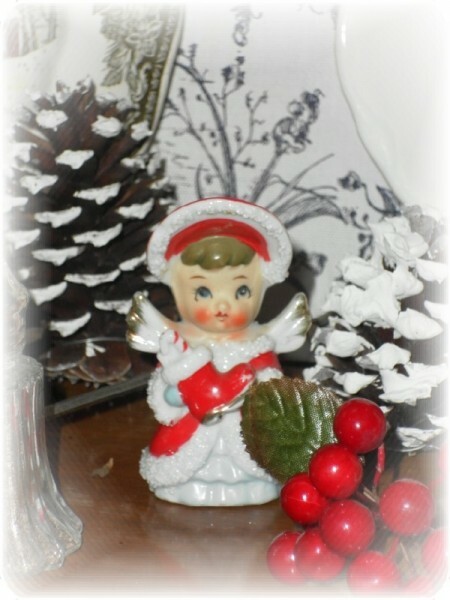 Vintage Christmas figurines like this one remind me of Christmas at Grandma’s house. I have very fond memories of going to Grandma and Grandpa’s house on Christmas day as a child. We still go every year to open gifts and have homemade turkey sandwiches for lunch. Grandma is in her 90 now and every Christmas at her house is a gift that I cherish. You can find reasonably priced vintage Christmas figurines on Ebay and Etsy.com . I love vintage animated Christmas dolls like these Vintage Telco Motionettes and have acquired quite a few over the years. I think I love them so much because they remind me of store windows decorated for the holidays when I was little. One of my favorite Christmas movies of all time is A Christmas Story with Peter Billingsley. 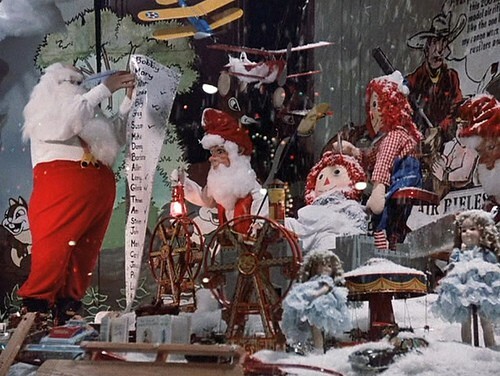 One of my favorite scenes is in the very beginning when the kids are pressed against the window at Higbee’s department store’s window gazing at the animated Christmas display. I love that! I wish more stores of today would continue the tradition of beautifully done holiday windows. 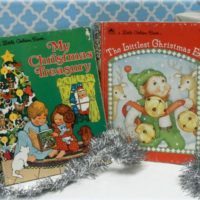 Display a collection of vintage Christmas books in a basket or on a table top for a festive look. 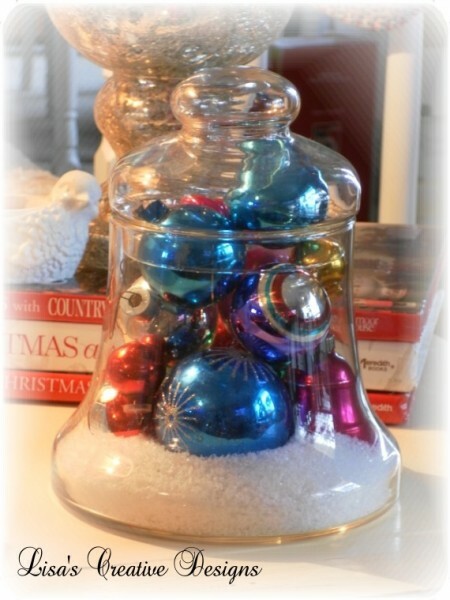 Fill everyday bowls and glass containers like this bell jar with a collection of vintage glass Christmas tree ornaments. 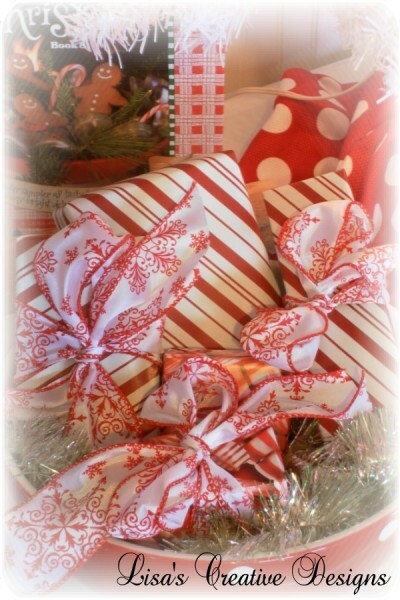 For a quick and easy decoration, wrap small empty boxes with vintage Christmas wrapping paper, embellish with ribbon and display them in bowls, on shelves or even under your tree! You don’t have to look far for small empty boxes. Save your toothpaste boxes, Jell-o and other boxes right from your kitchen! When setting your holiday table, create a simple napkin ring out of vintage tinsel garland and a vintage Christmas bauble. 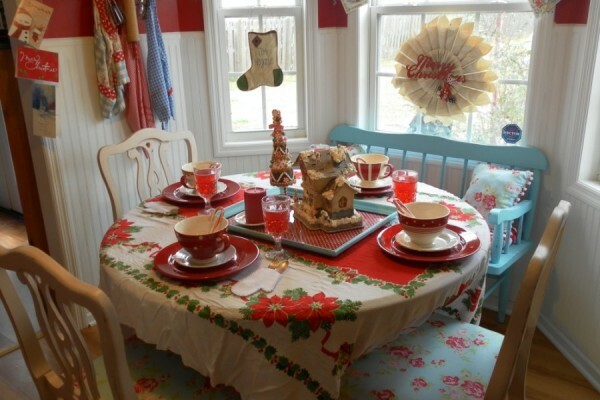 Decorating your home for a vintage style Christmas can be fun and affordable by using everyday items you already have and thrift store finds. When we decorate for the holidays we want it to look great but also make us feel great, all warm and snuggly and using vintage items in your Christmas design scheme can do just that. Appeal to all your senses during the holiday season. Make your home smell great with scented candles, potpourri and home baked goodies. Make sure you have vintage Christmas classics by Burl Ives, Bing Crosby and other artists wafting through the air from your stereo for a good, Old Fashioned Christmas! Thanks so much for visiting today. I hope you have a wonderful Christmas Season! You are amazing!! I love your blog posts. Thank you for all the inspiration. Aww, thanks Mary! I hope you have a wonderful Christmas! Oh, I love everything about this post. The spackle hint is great. 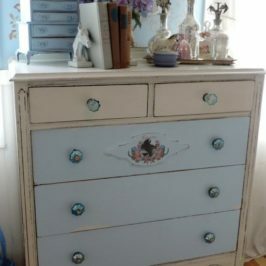 I'm coming back to take a seciod look and check out all the details. I remember my mother and grandmother bringing out the holiday tablecloth every year. It brings back such great memories! 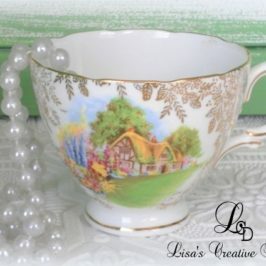 I love to collect those now along with frilly Christmas aprons. Yes I do wear them!! Everything is so beautiful! Absolutely love the Vintage Christmas Card Swag! Great tip about making pine cones look snowy! Everything is so beautiful. I recognize a few of my decorations. MERRY CHRISTMAS and a BLESSED NEW YEAR.